In the interest of being an unbiased observer, we present information prepared by Sawyer below. We have not edited this material and all information is provided and attributed directly to Tom Sawyer. This field trip is NOT a Friends of the Pleistocene field trip, but a trip being offered by Tom Sawyer. Read more about the exciting science itinerary below. PDF version of the material shown below. NORTHERN CALIFORNIA SHEAR ZONE—Atwater was Right!!! On that field trip I would have discussed the recently discovered Northern California shear zone of Sawyer (2013)(NCSZ), in the current model I informally refer to it a ‘tele-neuropathic’ secondary shear zone that, in addition, apparently functions like a crustal-scale baseball-throwing machine where the counter-rotating wheels are the bounding CW-Oregon Coast and CCW-Sierran plate-margin blocks. You might be surprise to learn that this and all other models, by definition, are wrong. Models approximate reality, they are not reality. So I was hoping that with the aid of FOP’s keen scientific eyes we would identify and discuss what those details are or might be, so that the model might be refined and improved. But no…. Also, I was prepared to announce, and take on all challenger’s, that I am the “Fulfiller of Atwater’s Famous Prediction” (modestly “The Fulfiller” —e.g., in informal settings, such as the FOP). Yep, I contend that after nearly 2½ decades “chasing” faults and folds led to ‘accidentally’ fulfilling that famous prediction—that the secondary plate margin would grow, evolve and integrate with the primary P-NA plate margin—made nearly a half century ago by arguably the most famous earth scientist of the 21st Century and still going strong, the ‘Mother of Tectonics’, Tanya Atwater (1970)—so, I promise to be more careful next investigation. If only, I had realized to take the prediction quite literally, practically like a roadmap of the State of California, I might have save lots time but also might not have discovered the “NCSZ North Branch. Thus, I proposed to organize—given the time constraints and considering the spontaneous combustion of the (+) terminals in my solar-battery bank when I might have misconnected a wire—more like ‘crash-landed’ the 2018 “Save-the FOP” Pacific Cell field trip. So I’m hoping that by throwing in some diverting Einstein and Atwater references, you just might not notice the state of dynamic-equilibrium this last minute field trip is sure to achieve. Regardless, we should be able to manage with a limited size group (50-75, maybe more). So there are likely to be typo’s and I know references will be missing from the crash-landing version, which when corrected a updated version of the guidebook likely will follow. Invaluably, Einstein insisted that it is essential to tap the passion, thought-limiting freedom and passionate sense of discovery exhibited typical only by children. That is, if scientist are to reach their true potential and broadcast their powerful collective voice. Translation, I figure, to not have a good time on this field trip, would be paramount to disrespecting simultaneously Einstein and Atwater, again.—Now how’s that for FOP logic?!! —Thus as a field trip perquisite, know that you must have a good time to be effective, as well as, grow as a scientist! Remember, too, the rusty barbwire mussel “awarded” to ‘Rob’ on Carver’s trip, where he was ‘asked’ to wear it and stand in front of FOP, while the ‘good scientists’ received their awards. Well, we still have the mussel, only it’s even more rusty and will use it until you start having fun on this trip. Unfortunately given the time constraints, I was unable to manipulate the continuum that is space-time, so am unable to arrange for the field trip participants to ride on a train traveling the speed of light with our tongs wagging, flash light shining, and our eyes watering plasma while relatively observing stationary clocks. Yet I have arranged the next best thing, for us all to ride the MTJ-Engine (i.e., Northern California shear zone) from the Northern Walker Lane Station, around the north end of the Sierra Nevada and across the northern Central Valley, to arrive at the ever-NW-moving Mendocino Triple Junction (MTJ), Transform Station. Our ultimate destination, however, the “Terminal” at the Blanco Fracture Zone Station. I’m not asking you to look beyond your invaluable textbook knowledge, but that too is a prerequisite as the NCSZ uses “Spooky Interactions at a Distance” to ‘know better’ than the entire earth science community—always has…always will—the position of its ‘preordained’ western terminus, the MJT (don’t just take my word for it, ask Tanya!). Likewise, the entire earth science community should be firmly slapped on the cheek for leaving Atwater’s (1970) famous prediction up to accidental discovery (Sawyer, 2013)—firm Face Slap! Get Ready to Ride the MTJ-Engine to the Blanco, or Bust! A good free-floating mind set to have (i.e., you might even call it—a ‘thought-expanding’ experiment), is the NCSZ does not exhibit typical fault behavior. Rather as a one-of-a-kind strategizing, tele-neuropathic secondary-margin shear zone it’s used these abilities to rapidly connect neurons (pre-existing structures), to sever its own neurons seemingly at will, and to re-link neurons as it did entirely across northern California in the past 1 Ma, or so. Suggesting that this section of the secondary plate boundary, the NCSZ, grew, evolved to intersect the Mendocino triple junction at a westward rate of roughly 3 cm/yr. Surprisingly, the NCSZ even uses situational awareness to change and reverse tactics in order to outwit (i.e., grow and evolve faster than) his less nibble bigger brother, the San Andreas transform fault system. The little brother got his MTJ hand cut off, but doubled back, and literally appears to have out passed the San Andreas transform fault system to the MTJ (this should make for some good discussion). The NCSZ will continue to telepathically ‘bird-dog’ and re-evolve connections with the MTJ, that is, until the MTJ-Engine’s pulls into it final destination, the Terminal at the Blanco Fracture Zone Station. Upon arrival the NCSZ make his bigger brother pay the ultimate price, ‘neotectonic beheadment’ of the San Andres transform fault system. 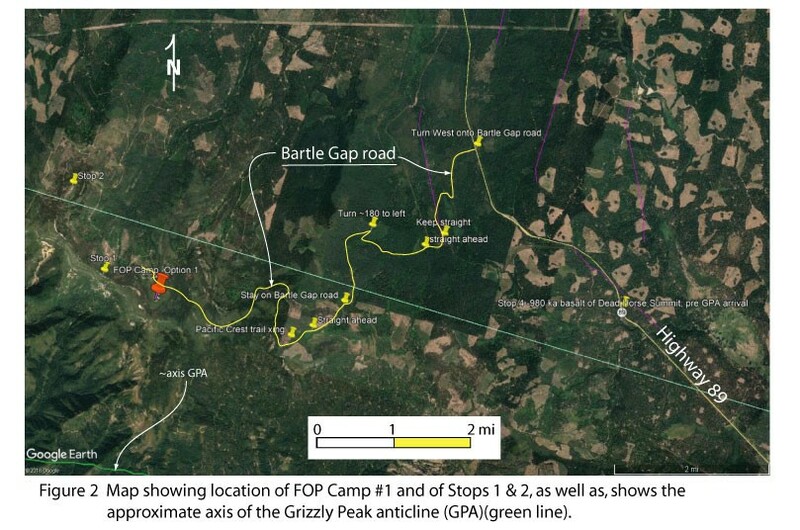 The proposed camp site (I’ll confirm site this Thursday) is ~35 km NNW of Burney, CA positioned atop the crest of a crustal-scale seismogenic fold in the earth crust, the Grizzly Peak anticline (GPA)(Figs. 1 & 2). The site offers wide vistas including of the ‘footwall’ Mt. Shasta volcano (14,180’/4,322 m), and into an erosional amphitheater at the head of Kosh Creek that widely exposes the Klamath Mountain core of the fault-propagation fold, as well as, an overlying folded volcanic section. Stops 1 and 2 are within walking distance. This is a primitive site, meaning there are no facilities of any kind. The attached KMZ file marks the location of significant turns to be made in route to the primitive camping area from Highway 89. We will make the west-bound turn on the west shoulder of Hwy. 89, north of Lake Britten—impounded by PG&E’s Pit No. 3 dam that straddles in its foundation a trace of the DSOD-active, Rocky Ledge-Burney Springs Mtn. fault zone of Sawyer (1996). Alternative, sound like we have the Hat Creek campground Saturday night, possibly longer, so that might be an option—see announcement for the recently canceled trip. Day 1: Loosely the plan is to begin the field trip the morning of Friday September 28th with a short walk to Stop 1 and then on to Stop 2)(Fig. 2), before returning on foot back to camp for lunch. After lunch, we will examine other aspects of the GPA at Stops 3 and 4. Day 2: We’ll spend most/all of the day examining the character of the Cascadia backarc rift south of the GPA, in the Burney Valley )(Fig. 2). We will discuss how the active western margin of the rift has stepped at least three times eastward in the past ~1.5 Ma. This will be argued as reflecting 10-15 km of eastward advancement of the GPA during this time, suggesting a lateral propagation rate of ~1 cm/yr. Day 3: I’ll throw out some suggested field trip stops and let the field trip participants decide what they are most interested to see. I would like to conclude the field trip by asking the participants their scientific opinion regarding the existence, evolution, and rate of growth of the GPA. Walking distance from Camp 1 will be Stop 1, where will look down into the large erosional amphitheater at the head of Kosh Creek where Plio-Pleistocene volcanic rocks at the crest of the Grizzly Peak anticline can be see warped (Fig. 2). Below and to the west we should be able to see the Klamath-Mountains bedrock core fault-fold structure. Here I’ll present an overview of entire Northern California shear zone, including the various sub-zone that are included in this broad, diverse and complex shear zone. I’ll also discuss some interesting aspect along its westward evolution from the northern Walker Lane, across northern California, to the Mendocino triple junction (MTJ). 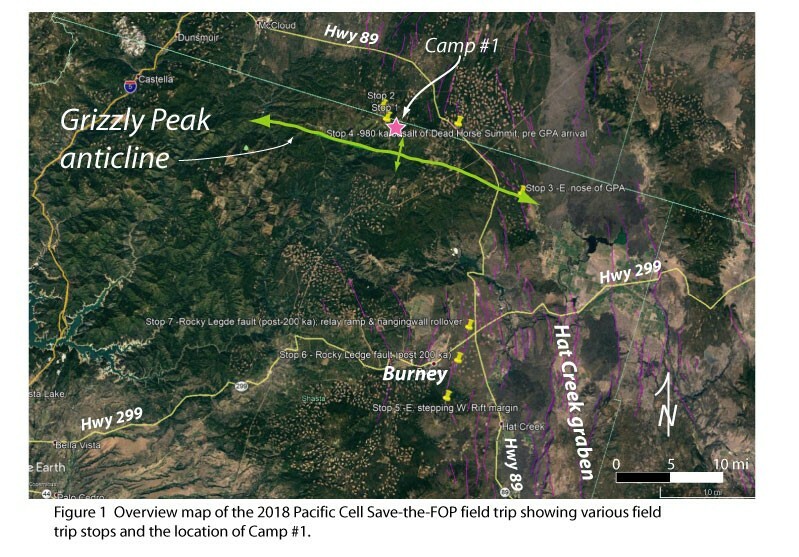 Also to be covered is eastward propagation of the Grizzly fault-fold structure across the Cascadia magmatic arc-backarc rift, between the upper McCloud River to the north and the Pit River to the south. I’ll reveal that this crustal scale fold is intimately related to eastward growth of the Klamath Mountains neotectonic province. Walking distance from Stop 1 is Stop 2, is near the topographic crest of the east-propagating Grizzly fault-fold structure (Fig 2). Here we will discuss the landscape position of some of, if not the, oldest volcanic rocks associated with the early Cascadia arc system, and their possible significance to growth and evolution of the GPA. The layered sequence of volcanic rocks rest unconformably on Klamath Mountain bedrock. Importantly, I’ll point out the absence of a source area for the layered flow-rock sequence in the modern regional landscape. Here we will look out over the actively extending Cascadia backarc rift and discuss how the GPA propagates through the rift, along with apparent interactions between this contractional structure and extensional faults of the rift (Fig. 2). I’ll also talk about how the entire rift sigmoidly deflects about the east nose of the GPA, suggesting about 10-15 km of eastward propagation of the GPA during the Quaternary. The rift axis appears to be sinistral offset an equal amount north of the GPA. One explanation might be drag along the southern edge of the CW-Oregon Coast block. This is an important stratigraphic marker for documenting the existence, character and eastward propagation of the GPA in the past 1 Ma (Fig. 2). The 980 ka (Ar/Ar) dated basalt of Dead Horse Summit (p.c., Andy Calvert, USGS, 10/2011) was a highly fluidized, low-K tholeiitic basalt having an initial graded depositional surface as low as about 0.5o (p.c., Mike Clynne, USGS, 10/2011). This flow has been backtilted to the north relative to its source area, which has been concealed by younger rock of the Medicine Lake Highland (p.c., Bob Christenson USGS, 10/2011). Duane Champion used a transect of paleomagnetic measurements along the east-side road cut of Hwy 89 at and near Dead Horse Summit showing a systematic change in the recorded declination confirming northward tilting (p.c., USGS, 10/2011). The basalt of Dead Horse Summit was deposited on the floor of the backarc rift about 1 Ma. At that time the eastward advancing eastern nose of the GPA had not yet arrived at this location. Today the eastern nose is some 10-11 km to the east. These relationship yield a lateral propagation rate of 1 cm/yr, or more. From this vantage point we will a high escarpment prominently bordering the Burney Valley to our left/west (Fig. 2). To the east of that escarpment is a lower, rounded escarpment of the Goose Valley fault. Still further and more-or-less bordering Burney on the west is the pre-200 ka Burney Valley fault. Still further to the east, to our north, is the post-200 ka Rocky Ledge fault. Prior to the cone of Goose Mountain, prior to 1.4 Ma (K/Ar)(add ref here), the Hatchet Mountain fault formed the western margin of the northern Hat Creek. Subsequently, the active margin stepped eastward to the Goose Valley fault. This fault probably has had experienced a Holocene event but the rounded character of the associated fault escarpment suggests that the fault is characterized by long recurrence intervals between surface-rupturing events. The Rocky Ledge fault today forms the active western margin of the northern Hat Creek graben and post-dates the 200 ka basalt of Rocky Ledge, exposed at the rim of the escarpment (Fig. 2). The 70-80 m escarpment prominently defines the southern Rocky Ledge fault. From helicopter reconnaissance small scarps and subparallel furrows can be seen disrupting the talus slopes indicating a recent surface-faulting event(s) along this fault. Here the Rocky Ledge fault forms two overlapping fault traces forming a relay ramp between the ends of the fault traces (Fig. 2). Of possible interest is the is a ‘hanging wall rollover’ where the depositional surface of the basalt of Rocky Ledge steepens towards the fault. On Day 3 I’ll throw out some suggestions and let the field trip participants decide what they are most interested to see. This entry was posted in 2018, pacific cell. Bookmark the permalink. Any vehicle ok for access? I sent Tom an email. I would recommend high ground clearance vehicle but not necessarily a 4×4. The most we drive on dirt is to and from the camp. Title can be misleading, some may stop reading as it appears there is no FOP trip in 2018. We’ d like to maximize turn out . Well, the 2018 Pacific Cell FOP field trip was cancelled. So, we cannot mislead people to think otherwise. I did edit the post to emphasize the trip and not the cancellation as you suggested. Thanks!